This entry was posted in General, Prairie Management, Prairie Plants, Prairie Restoration/Reconstruction and tagged burning, defoliation, grass dominance, grassland management, grazing, haying, mowing, plant diversity, prairie management, prairie restoration, prescribed fire by Chris Helzer. Bookmark the permalink. Last fall I conducted strip disking in a stand of overly-dominant WSG (big bluestem and indiangrass, primarily) and overseeded the disked area with a mix of forbs, in an effort to set back the grasses and encourage forb diversity. Can you speak of any experience, good or bad, with disking to boost diversity? Rich – I have limited personal experience with disking (we’ve only tried it 3-4 times). However, from what I know of it and from what I’ve learned from others, it can be very effective. I would VERY cautious about disking unplowed prairie, of course, because there are some important soil flora and fauna communities as well as a number of plant species that might not recover well. However, in seeded prairies dominated by grasses it can sometimes be a good tool. I’ve been surprised by how strongly warm-season grasses can recover within just a year or two of a fairly aggressive disking treatment. In fact, we once tried to get rid of eastern gamagrass by triple disking a site that was planted to a monoculture of it and the stuff wouldn’t die! I know there are others who read this blog regularly who have more experience with disking/seeding than I do, so I’m hoping they’ll add comments here as well. I’d like to echo Chris’ caution about disking remnant prairie. I’m inclined to think that any tap-rooted forb that has it’s tap-root severed will die under typical conditions of soil moisture. 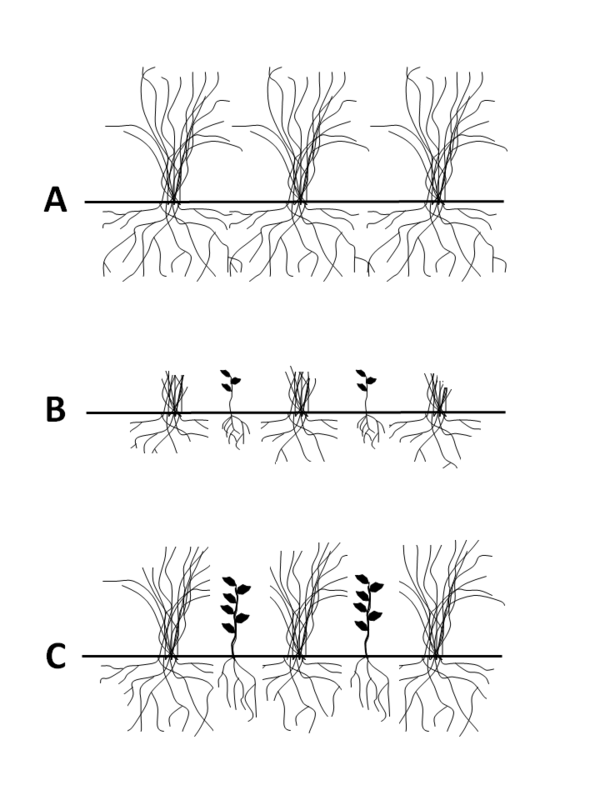 In contrast, rhizomatous species should respond well to disking because having a rhizome severed may stimulate associated buds to initiate new growth/tillers. Chris – one thing I’ve been wondering about lately is how some of the conservative forbs may in fact be quite competitive themselves, and not subject to the same competitive dynamics with grasses that we typically envision. Looking at some of the eastern Nebraska hay meadows the last couple of years I’ve been seeing what appear to me to be a high diversity and abundance of conservative forbs, in spite of the fact that they’re growing in what I assume are vigorous stands of grass. This might go back to the eastern/western prairie discussion some of us are familiar with (especially recently) and the sub-topic within that discussion about the prevalence of herbivory (i.e., defoliation in the context of your post) in the east vs the west. IF eastern prairies had historically low levels of herbivory, PERHAPS selection has favored associated forbs in those prairies that are capable of competing with the grasses instead of having to rely on herbivory to provide them with competitive release. Thrice: A 59-Year Study. American Midland Naturalist 164:311-321. Steve – there’s a lot to respond to in your comment…! First, I think you’re right that there are a number of forbs that are very competitive with grasses, and can hold their own – at least in many prairies. Whether that’s because of something intrinsic to those species or something in the prairie environment that balances competition I don’t know. Second, I think it’s likely that hay meadows have a somewhat weaker grass stand than a prairie that is not annually hayed. Obviously, the timing of the haying (especially relative to the phenology of the grasses) makes a big difference. But I think annual haying, in general, probably helps those species that bloom prior to cutting and hurts those that bloom later. So even though those sites have a good diversity of early and mid-season plants, they don’t have much going on in the late summer and fall because the prairies are only a few inches tall! Third, some would say (and you’re well aware of this, I know) that high plant diversity is the major measure of success in prairies, and others would say that habitat structure and the inclusion of historic (or at least important) processes such as fire and grazing are also necessary. My November 9, 2010 post dealt with that topic. A prairie that is maintaining high plant diversity through annual haying or annual prescribed fire (I’ve seen good examples of both) may be in great shape, depending upon what the objectives are for that prairie. On the other hand, it might be missing plant species that require different management, and is surely missing animal and insect species that require habitat structure not provided by that management. I’m not trying to sidestep the question about whether or not annual fire or haying can maintain high diversity plant communities in prairies. I’m confident that they can and have. I also have questions, though, about whether that’s sustainable – or if it’s largely because many prairie forbs live so dang long that it takes a very long time to see species loss through lack of sexual reproduction. I don’t honestly know the answer to those questions. I also worry about whether or not those prairies could have even HIGHER plant species richness and/or diversity if they had a more varied management regime applied to them. The only way to know is to try. And finally, – again – there are a number of insect and animals species that need a more varied habitat structure than can be provided by a repetitive uniform management regime like annual fire and haying. The importance of those animal species has to be determined by local objectives. Anyway, yes, it’s an interesting discussion to have. I certainly don’t know the answers, but enjoy learning more all the time! Sounds pretty complicated but what I’d expect from a thriving multi-culture. 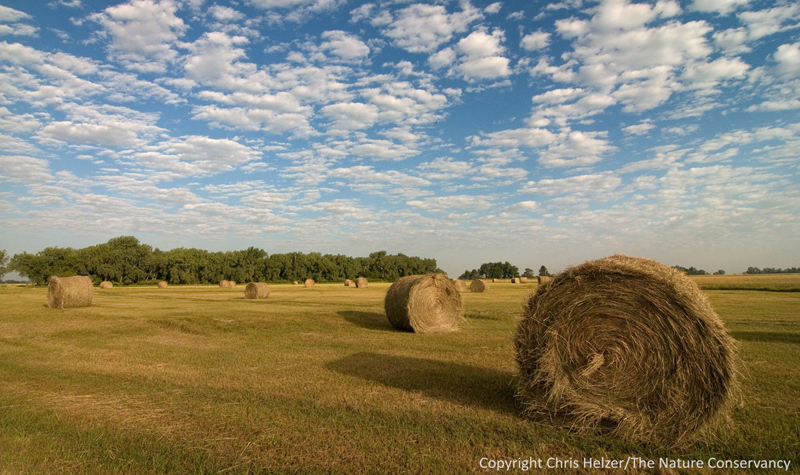 Were the original prairies diversified via fire and grazing only? Or were there other factors involved – say harsh winters? Good question, Mel. We don’t really know. There’s lots of discussion, and much opinion that is divided regionally. That could be because prairies acted very differently in each region, or it could be the varied perspective on what “good” prairies look and act like. I doubt that harsh winters had too much to do with prairie plant diversity – other than to help keep woody species out. I think most prairie plants are pretty equal in their ability to withstand winter conditions because they’re dormant at that time (I could be wrong about that). I think fire and grazing were large components – at least in the prairies I know best. And climate was also extremely important. I’m inclined to agree with Chris that harsh winters have little to no meaningful effect. Droughts are another matter and we have good descriptions from the early to mid 20th century of these substantial effects from the work of John Weaver. A biotic effect that we’ve lost (although I’m not sure how prevalent it would have been in the tallgrass region) is episodic, severe herbivory by Rocky Mountain locust, the now-extinct migratory grasshopper that was the basis of pioneer many tales. Fascinating post! 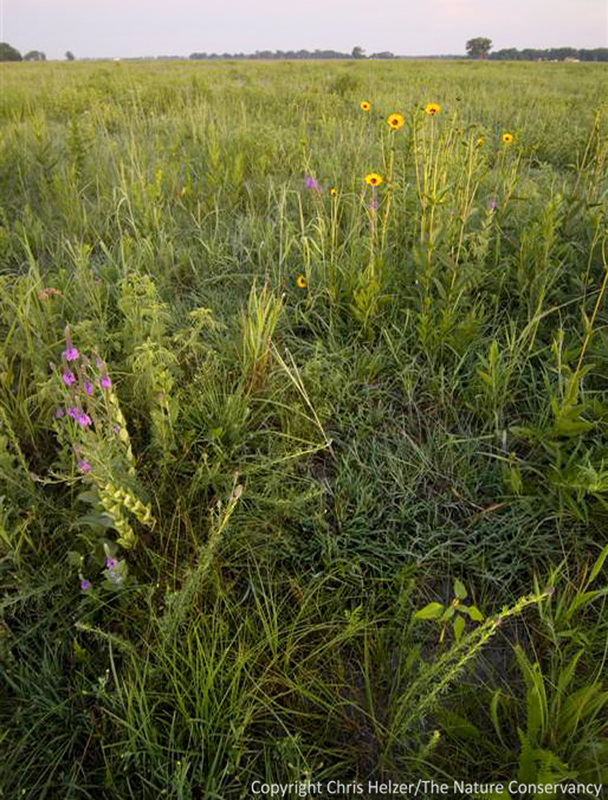 I think it’s worth mentioning that the prairie natural areas in Missouri, about which there has been some controversy lately (about whether to do patch-burn grazing on them), were hayed annually before they became protected and designated as natural areas for their diverse florulas. Any thoughts on that…? Thanks. See my response to Steve W. I don’t claim to understand it all. I just have a lot of questions. Good thing you live in Nebraska. Mowing, haying, herbicides, patch grazing? Them’s fightin’ words here in Missouri! A 2 acre remnant loess hill prairie in southern Illinois, that has been rescued from significant woody invasion over the past 5 years, is now overly dominated by Bluestems and Indian grass. Forbs have noticeably diminished in the past 2 years. June grass and Canadian rye are the cool season components. 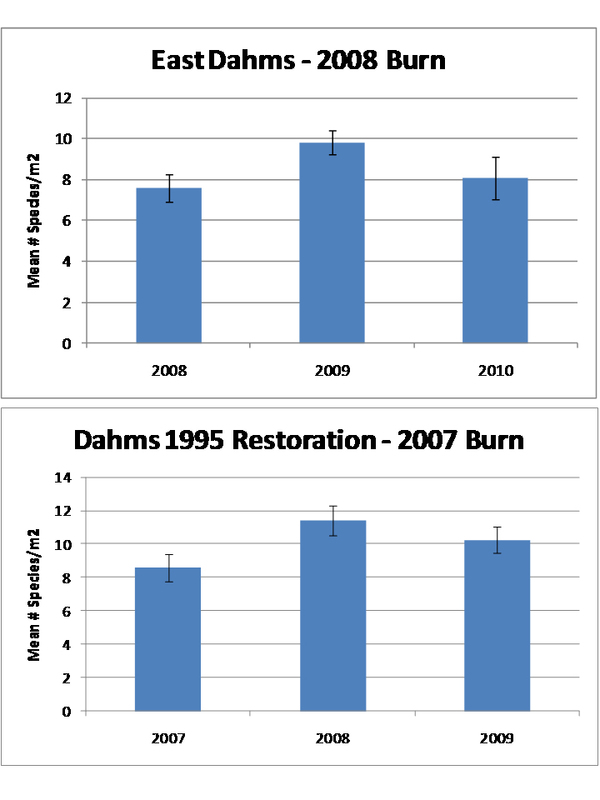 The prairie has had 3 spring burns, 2007, 2008 and 2011(only 50% ). The plan is to start burning in Fall to stop favoring the grasses. A 1973 inventory showed 60 species and presently it’s probably about 50. In dealing with the grass dominance how does one decide between a growing season burn or a weed eater and for either method what should the timing be. Either method would be performed as an experiment on a relatively small area. Dennis – it’s a good question, and I’m not going to give you a solid answer. I think it’s a great idea to try a small experiment, and I’m not sure there’s a good way to decide between a fire and a weed eater. (Try both!) In terms of timing, there are a couple choices. If you use the weed eater, you could hit bluestem/indiangrass repeatedly through the season (and mow around forbs as feasible) to keep the vigor of those grasses down. I’d mow as short as possible – if you leave too much height on those grasses they can actually increase their horizontal spread. Another option would be to mow or burn as the grasses are just starting to flower and try to knock their legs out from under them just as they’re at the peak of their energy expenditure for the season. I think either way could work well – but you’ll have to see what happens. I’m glad to hear that you’re willing to try some experimental ideas. Please let me know what you do and how it works! It’ll be important to watch for any invasive species that might try to fill the void left by the big grasses, but hopefully you’ll see that open space colonized by prairie forbs instead. Chris – do you have any thoughts about how using bison for grazing might differ from using cattle? Suzanne – the biggest differences are behavioral rather than related to diet selection. We’re finding that the diet selection of bison and cattle is very similar when they’re managed in the same way. They’d both rather eat grasses than forbs. Behaviorally, bison are less likely to trail in single file, sit and poop in water, or congregate in shade. However, you don’t see many of the behavioral “benefits” of bison unless they’re managed on a pretty big scale (several thousand acres or more) where they actually can act like bison. Also, there are some big logistical challenges in running bison, including the need to keep them year-round (as opposed to bringing cattle in for short periods – up to 6 months – through a lease arrangement). In addition, there are strict innoculation requirements for bison that requires them to be rounded up and medicated each year, and fences need to be a bit stouter than for cattle. In most cases, cattle make a good substitute for bison, although you have to be thoughtful about how they are applied to minimize some of their drawbacks (trailing, pooping in water, etc.). A few weeks ago, the range ecologist for our local NRD and a landowner who is delighted with the range ecology improvement on their pasture after leasing it to us, asked us to come quick, quick and fence a stand of 5 and 6 year old CRP and graze it. We developed a four year program to rotate the grazing. Yesterday, we received an email announcing that the spring grazing treatment was off limits. I found your site while trying to research why such a decision was made. I appreciate your insights, they help me understand what might have been the thinking. Unfortunately, in the case of this parcel, that early spring grasses like brome and the annual weed grasses are the limiters, rather than the seeded switchgrass. Because one of the objective is wildlife habitat, and grassland birds are what most people consider to be wildlife, nesting season gets a little more priority than it probably should. I’m glad you’ll be able to do any grazing at all, actually, because that’s a relatively new phenomena in CRP. 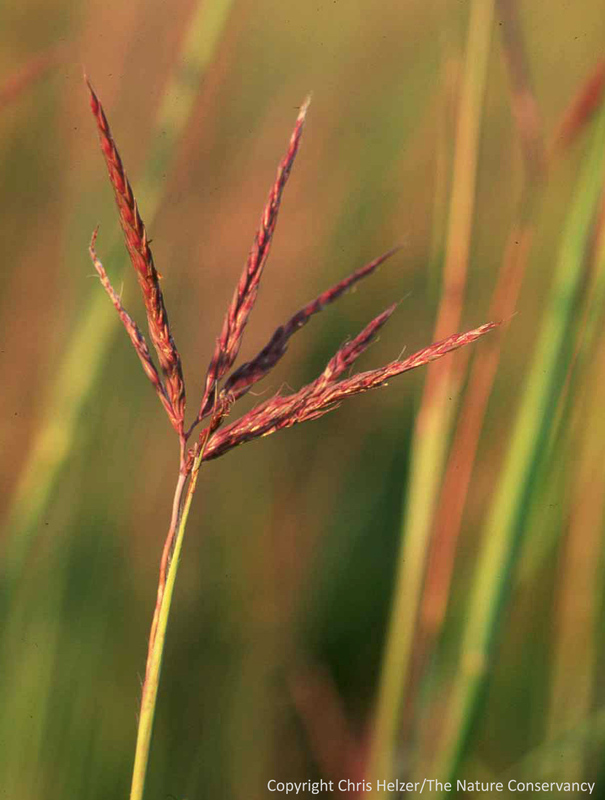 It might be worthwhile to run some questions up the chain in NRCS – if you can show them that the brome is causing problems and that there are long-term benefits to suppressing it, you might have some luck. Just found out about your site from NE games and parks. Looks like I have a lot of reading to do! I live in Springfield and in 2009 had an acre of brome killed off. In spring 2010 I had it drill seeded with prairie grasses and wildflowers. The grasses are little bluestem, side oats grama, blue grama, and buffalo grass. The flowers are 9 annuals and 21 perennials. The wet season gave me good establishment of the prairie but also was good for yellow nutsedge and foxtail. I used Sedgehammer and got the nutsedge under control. In November I over seeded areas that didn’t establish as well. Here are some pictures of last year. This spring a lot of flowers are coming up and some areas of brome coming back. I zapped the brome with roundup over the weekend. I know that some flowers will die but think it’s better to control the brome now than worry about flowers. The grasses are starting to wake up and I’m hoping the 2nd year will be more impressive. Here is what things looked like a week ago. Sounds like you’re doing the right kinds of things to get your plants established. I think you’re right to hit the brome now while you’ve got a chance. It’s also important to do the best you can to kill it out along the edges of the site so it doesn’t just creep in over time. Good article. I wish I had read it last week. We just did a small reduction project in Racine Wisconsin. This reconstructed prairie was planted in 1996 and is now dominated by big bluestem. The property owner asked us if we could reduce the density. We said probably. We clipped the heads off simply to make it easier to spray the bluestem. We waited a few days and then treated the area with the maximum dose of Fusilade 2. Your article stated a using a light dose. Hmm? We really don’t know what is going happen as the Fusilade label. does not talk about fall applications for warm season grasses. I will keep you informed if you are interested and also would like to know what you think might happen? Well, it is almost June here in Wisconsin. The fall application of Fusilade did not do much, if anything. The Bluestem is now about a foot tall and looks pretty good. We will try again. I do not recommend fall application of Fusilade for Big Bluestem stand reduction.